I have always loved paprika. My first exposure to it was the light dusting on the top of my mom’s deviled eggs that she frequently made when I was a kid. To six-year-old me, paprika made the simple eggs look elegant. I liked that, even way back then. For anyone who is unfamiliar, paprika a ground spice. 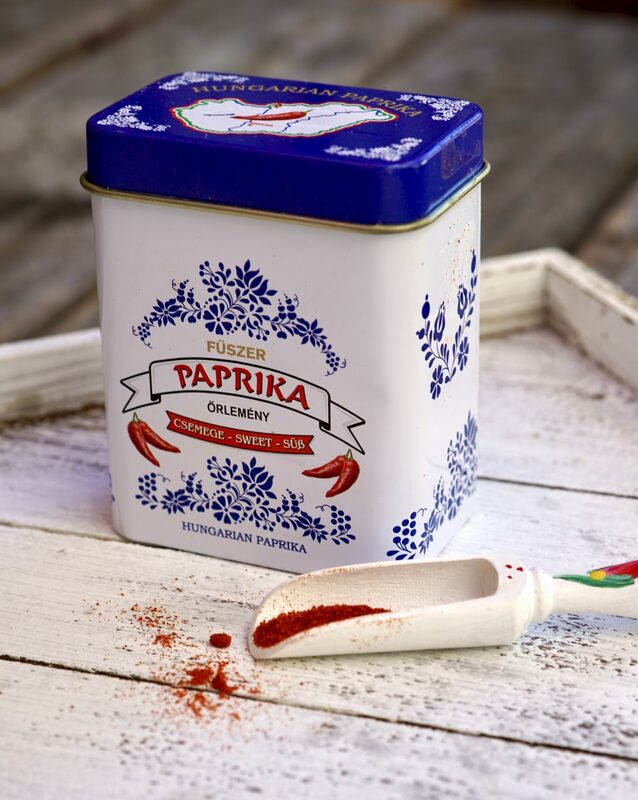 In its simplest form, paprika is made from grinding sweet pepper pods to create the iconic vibrant red powder. But what most don’t know is, depending on the variety of paprika, the color can range from a bright orange-red to a deep blood-red and the flavor can be anything from sweet to hot. There are three types of paprika; the first is sweet Hungarian paprika (the most common) which adds vibrant color to any dish. Sprinkled over deviled eggs or potato salad, it has a slightly sweet pepper flavor but without any heat. The second type is hot Hungarian paprika, and is often considered superior. 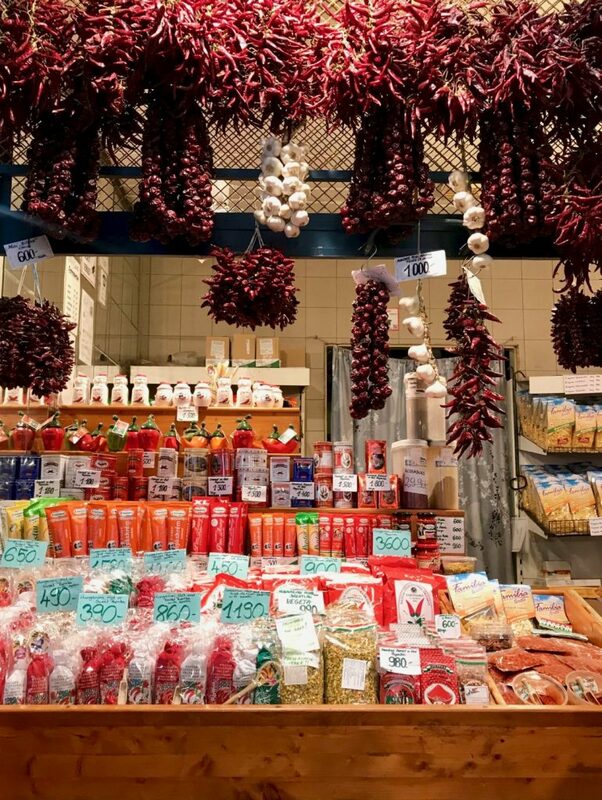 In Hungarian cuisine, paprika is mainly used as a flavoring method, not just for color like in the US. Hot paprika adds a more peppery, spicy kick to a dish. The third type of paprika is smoked paprika, (often called Spanish paprika). This paprika is made from peppers that are smoked and dried over oak fires. This process gives the red powder a very rich, smoky flavor that I love. You can find this smoked variety in mild, medium-hot, and hot. While traveling in Europe this past summer I had a lot of goulash, a popular stew in Central Europe that traces back to the 9th century. This dish was commonly eaten by Hungarian shepherds back in the day. I have to say, I was not originally a fan. But by the time we made our way to Hungry, something changed. I credit the amazing paprika. I’m talking about the good stuff. The flavor was better, more defined and reminded me of another beef dish I love, beef bourguignon. With my new discovery I was committed to sampling all that I could. 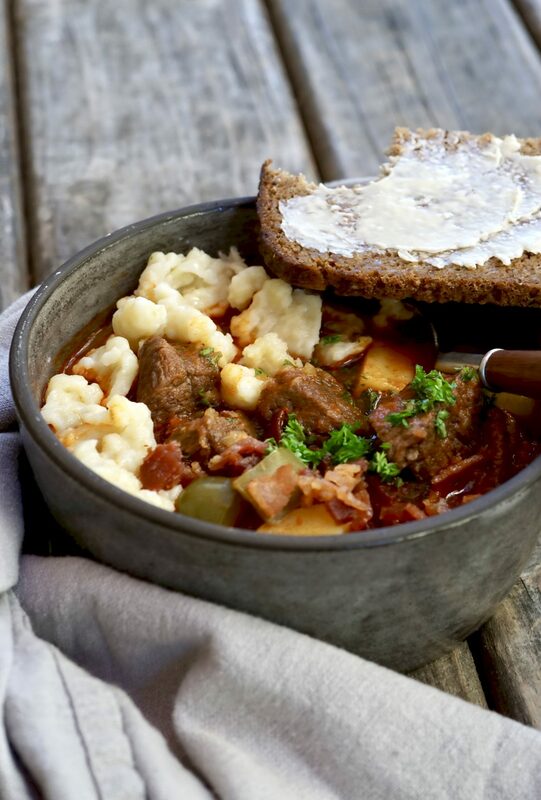 Some of the Hungarian goulash I had was served straight up in a bowl no garnish, some was served with a hearty dense rye bread, and others with pillowy spatzle, or little “dumplings” as they are often called. All ways are completely acceptable. 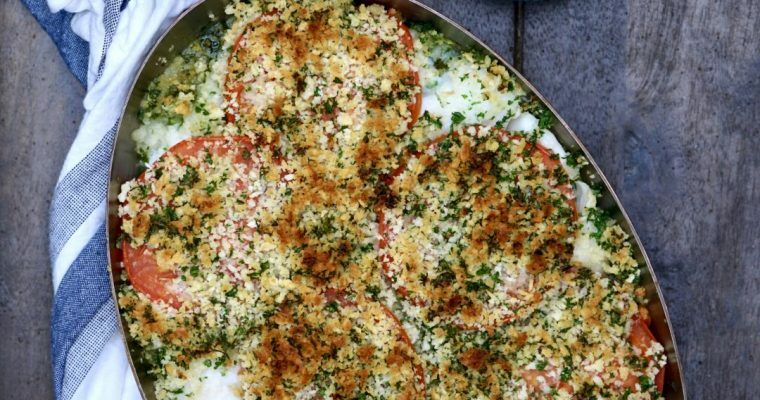 I personally liked bread for dipping, but my boys prefered spatzle. In the photos I have both, but I did not include a recipe for spatzle in this post. 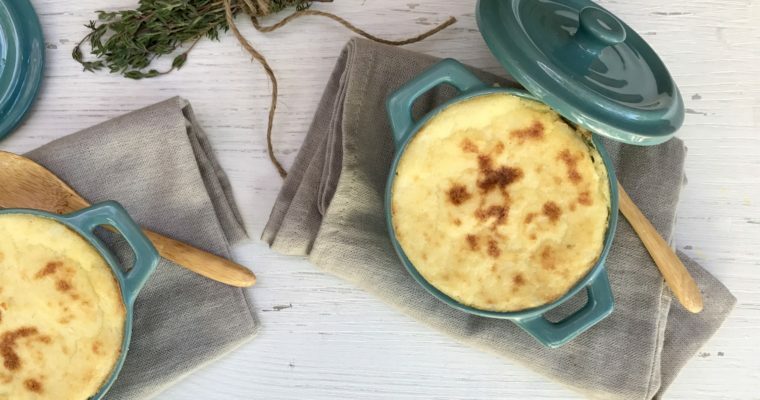 If your interest in making this traditional European accompaniment when you make your goulash, check out this link on how to do it. For my goulash recipe I used a sweet Hungarian paprika that I brought home from Hungary. I have also made it with hot paprika. I liked it both ways, but my kids prefered the sweet one with less heat, so that’s how I write this recipe up. That said, both kinds work. 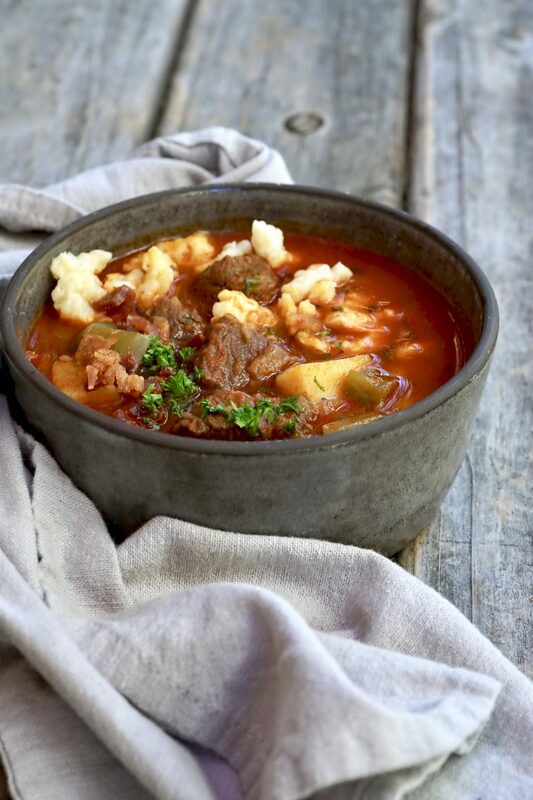 Hungarian goulash, when made well, with good quality paprika, is a wonderful comfort food perfect for a cold winter night. 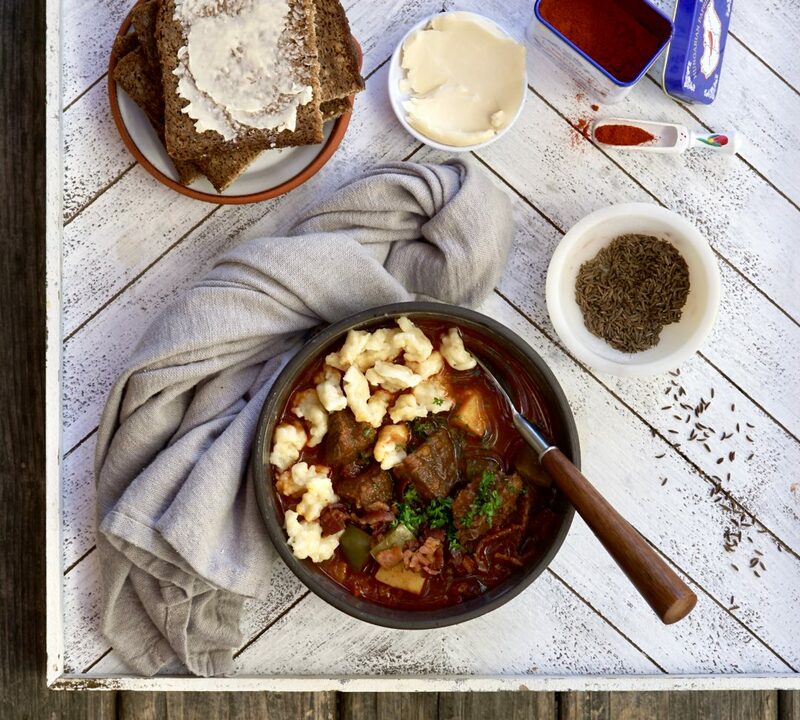 I must say, I’m glad I did not give up on trying goulash as it’s now a family favorite. Step 1 Place a large Dutch oven over medium heat. Add the bacon and cook until crispy, about 5 minutes. Transfer the bacon to a plate and reserve leaving the bacon fat in the pan. Adjust the heat to high. Step 2 Season the beef generously with salt and black pepper. Working in batches, add some beef to the hot bacon fat and sear, being careful not to over cook the meat. Cook until the meat is browned on all sides, about 5 minutes. Transfer the cooked meat to a separate plate and repeat the above with the remaining beef. Step 3 With the flame still on medium, add the onions and 1/3 cup cold water. Cook, stirring occasionally, until the onions are nice and tender and most of the liquid has evaporated, about 5 minutes. Add the paprika, tomato paste, and caraway seeds and cook for an additional 2 minutes. Step 4 Add 6 cups cold water and the apple cider vinegar. Place the seared meat and it’s juices back into the pan and bring to a boil/ Reduce the heat to a simmer, cover partially and simmer for about 1 1/4 to 1 1/2 hours. Step 5 Add the diced potatoes and fish sauce, cover completely and simmer about 1 hour until the sauce has thicker and the potatoes are tender. Step 6 Add about 1/2 teaspoon salt and some additional black pepper to taste. Step 7 Serve in bowls with crumbled bacon and parsley on top.